When it comes to Pfaltzgraff Patio Garden dinnerware, the choices are pretty amazing. The dinnerware pattern is available in several styles of dinnerware sets and there are awesome table setting accessories and serveware to match. 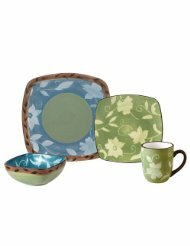 This dinnerware pattern is somewhat summery with flowers and vines that are silhouetted in lovely colors of sage green and cornflower blue. It is very colorful, but not overbearing. What is wonderful about this pattern, is that you get it in earthenware dinnerware sets, melamine dinnerware sets, or square dinnerware sets. This makes it appealing to hosts and hostesses who entertain indoors and outdoors and thrive in creating unique table settings. The Pfaltzgraff Patio Garden dinnerware pattern is simply amazing. The earthenware dinnerware is microwave and dishwasher safe, which is a good thing when it comes to everyday dinnerware. It also makes awesome table settings and there are several serveware to match which makes it ideal for entertaining. When purchased directly from Pfaltzgraff, the service for eight comes with a flower shaped platter and vegetable bowl which is a good start on a complete dinnerware and serveware set. Square dinnerware sets of earthenware are also available in this pattern. You can refresh your table with the square settings, or you can mix and match the traditional shapes with the modern shapes for a creative table setting. Melamine dinnerware sets are available in this pattern as well. Melamine is great for outdoor use. If you have garden parties or cookouts but want to stay kind of fancy, this dinnerware might be for you. I don't suggest melamine dinnerware for everyday use because of the way most American families live these days. Melamine is not safe for microwave use. That is important to me because I have kids who don't pay attention to what is and is not safe to put in the microwave; however, I would go for a set like this to use in outdoor dinner parties. It is very nice to have serveware choices that coordinate with your dinnerware. If you like this coordination, you can count on Pfaltzgraff dinnerware patterns. The Patio Garden Dip & Mix Set by Pfaltzgraff is pretty cool. Other options of serveware include wine tapa plates, pasta bowls, buffet plates, sandwich servers, dessert bowls, serving bowls and platters in various shapes and sizes, gravy boats, covered butter dishes, sugar and creamer sets, pitchers, glasses, coasters, spoon rests, trivets, and so forth. Placemats, floor mats and various kitchen décor items are also available in this pattern. It is great that Pfaltzgraff offers this pattern in dinnerware sets or in open stock.. That makes it possible to mix and match dinnerware if you like to do that for creative table settings.